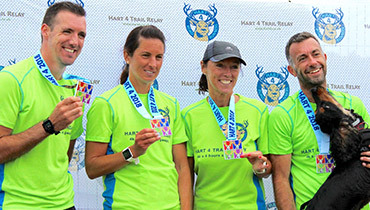 Register your team for the Hart 4 2019 here! Each entry you add is for a full team of 4 – there is no need to add an entry per team member. Once you have completed your purchase you will need to log in to your account here to manage your Team Name and Team members. You can edit your team up to Friday 26th July 2019. Your 2019 entry includes a Free Technical T-Shirt for each team member! As with previous years, there will be three race categories, Male, Female and Mixed. You don't need to choose when entering which category you wish to enter - we will assign your team into the correct category based on your team members, so please ensure this information is kept up-to-date!